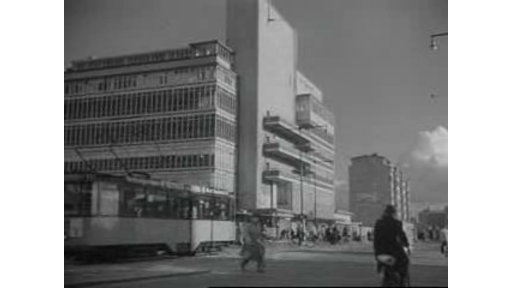 Film by Herman van der Horst about the reconstruction of the city centre of Rotterdam after World War II. Second reel of 'Keep it that way'. This part focuses mainly on the harbour activities and the building industry. Tug boats pull freighters to the quay, where they're unloaded (Marshall aid). Construction workers are busy with the reconstruction of buildings (driving piles, laying bricks, drilling) and the groundwork. A fruit salesman extols the virtues of his goods, an organ grinder collects money with a small bin. Everybody is surprised when the drum band of the marines passes by via the Coolsingel. Panorama footage of the heart of Rotterdam, filled with building activities.